Fancied a break from modelling other things and am going to try to whip up the batmobile from batman begins. Unfortunately I have a few good shots but am lacking any overhead views. If anyone has any decent views lookind down it would be very usefull. cheers pbman they will be v usefull. Can't find any overhead views so I have taken your advice cris and am using some shots from the film. Here is a small update. O.k. here is another small update. i've got some blueprints of this thing somewhere on a cd, if i can dig them up i'll post them..
Was thinking of modeling it not too long ago, but i dropped it for the Falcon, atleast for now.. maybe one day i'll do it..dunno..
Ok here is another update. I am having trouble with the back end though due to a lack of decent pics. If anyone has any please let me know since it looks like I am gonna have to use my intuition on a lot of stuff otherwise. Should still be fine but would rather get things perfect. Started on the booster on the back + tweaked a few areas slightly. Not to sure how to go about modelling the oval sphere that surrounds the booster. 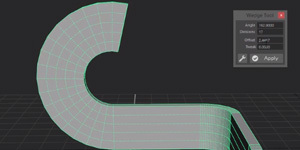 Think that the best bet might be to model it as a nurb and convert to poly. Problem is the only way I can think to insert the booster would be using the booleans tool which often results in problems and poor geometry. I am a bit of a newbie so if anyone has any suggestions they would be appreciated. Ok heres a quick attempt before I go to work. Dont worrt about the wheels looking all wrong since they are just stand ins till I make some proper ones. I found those pics i was talking about..
My advice, is just model it as a seperate peice of Geometry and Parent, or Group it to the main body of the geometry..Not everything can alwsays be a single mesh, and sometimes, its actually beneficial to make somehting a seperate mesh, even if you have to just..oerlap it wiht some other geometry..
Look at my two threads in my Signature,.. all the detail in them are seperate peices of Geometry mostly... A base mech for shape, then alot of little bits added in for effect.. Cheers for the pics legendofzombi it is greatly appreciated. The exterior is nearing completion. Only a small amount of work to do on the front still and then details need to be added to the back end. Also I need to create some decent tires and alloys which I will probaly work on next. Once all completed I will be moving onto the interior. Cool to see youre going to do the INterroir...didnt know if those pics would be of any use to you or not, But i'm glad they are..
Just started on some tires for the front. Still need the alloys though. Ok I am working on the rear tires but the treads are a little bit nuts. I am wondering if anyone has any tips as to how I should go about creating them. I know I could simply make a bump map but would rather create the actual geometry. If anyone has any suggestions it would be appreciated.